Reflection Question 3: The gospel today concludes the Sermon on the Mount, the ‘New Law’ fulfilling the old law of Moses’. 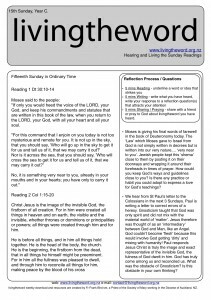 Jesus reminds disciples his words are to be ‘lived’ not simply ‘learnt’. Knowledge of Jesus and prayers to Jesus will not bring entry into the kingdom of heaven. The gap between ‘hearing’ and ‘doing’ is obedience. How could you practise obedience to God? Reflection Question 6: A Samaritan was the cultural equivalent of a terrorist or drug dealer. It was the greatest shock for Jewish listeners to have a Samaritan as a hero surpassing a religiously observant Priest and Levite. The Samaritan put his money where his mouth was. His love for God showed itself in deep compassion not simply pious thoughts or words. Oil and Wine were gifts offered at the altar, used now to soften and disinfect wounds. 2 days wages and a promise of more if needed reveal not just first aid but ongoing care. What inspires you in the Samaritan’s actions? What would it look like for you to ‘go and do likewise’?